Robin Youngs, Edward Fisher,	The Journal of Laryngology & Otology, Volume 129 Issue 10, p 935. R C Edmiston, R Aggarwal, K M J Green,	The Journal of Laryngology & Otology, Volume 129 Issue 10, pp 936-940. C W Metcalfe, S J Muzaffar, C J Coulson,	The Journal of Laryngology & Otology, Volume 129 Issue 10, pp 941-944. R Shankar, R S Virk, K Gupta, A K Gupta, A Bal, S Bansal,	The Journal of Laryngology & Otology, Volume 129 Issue 10, pp 945-949. M E Jellinge, S Kristensen, K Larsen,	The Journal of Laryngology & Otology, Volume 129 Issue 10, pp 950-954. Paediatric acute mastoiditis, then and now: is it more of a problem now? B Attlmayr, S Zaman, J Scott, S G Derbyshire, R W Clarke, S De,	The Journal of Laryngology & Otology, Volume 129 Issue 10, pp 955-959. C A Foster, C K Pollard,	The Journal of Laryngology & Otology, Volume 129 Issue 10, pp 960-963. A O'Connor, L Behan, M Toner, J Kinsella, E Beausang, C Timon,	The Journal of Laryngology & Otology, Volume 129 Issue 10, pp 964-969. G J Watson, C Nelson, R M Irving,	The Journal of Laryngology & Otology, Volume 129 Issue 10, pp 970-973. M Camacho, M Robertson, J Abdullatif, V Certal, Y A Kram, C M Ruoff, S E Brietzke, R Capasso,	The Journal of Laryngology & Otology, Volume 129 Issue 10, pp 974-979. C Hopkins, R Almeyda, H Alreefy, H Ismail-Koch, J Lim, V Possamai, S Powell, R Sharma, I Hore,	The Journal of Laryngology & Otology, Volume 129 Issue 10, pp 980-985. S D Sharma, S Jayaraj,	The Journal of Laryngology & Otology, Volume 129 Issue 10, pp 986-989. S D Sharma, G Kumar, A Eweiss, P Chatrath, H Kaddour,	The Journal of Laryngology & Otology, Volume 129 Issue 10, pp 990-995. 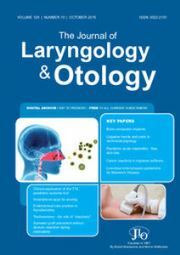 S D Sharma, G Kumar, H Kanona, T Jovaisa, H Kaddour,	The Journal of Laryngology & Otology, Volume 129 Issue 10, pp 996-999. M S Miah, S Majumdar, S White, M Robinson, N Kernohan,	The Journal of Laryngology & Otology, Volume 129 Issue 10, pp 1000-1003. R A Steven, A J Kinshuck, M S McCormick, L R Ranganath,	The Journal of Laryngology & Otology, Volume 129 Issue 10, pp 1004-1008. A Gupta, J Stokken, P Krakovitz, P Malhotra, S Anne,	The Journal of Laryngology & Otology, Volume 129 Issue 10, pp 1009-1012. L-F Ye, J Huang, L-P Zhang, Z Chen,	The Journal of Laryngology & Otology, Volume 129 Issue 10, pp 1013-1019. W-C Chen, H-C Chuang, Y-Y Su, C-Y Chien,	The Journal of Laryngology & Otology, Volume 129 Issue 10, pp 1020-1024. E Kaya, T Catli, H Soken, C Cingi,	The Journal of Laryngology & Otology, Volume 129 Issue 10, pp 1025-1027. A S Taghi, M Bentley, R Kuchai, H A Saleh,	The Journal of Laryngology & Otology, Volume 129 Issue 10, pp 1028-1031. M-L Mørkenborg, M Frendø, T Stavngaard, C Von Buchwald,	The Journal of Laryngology & Otology, Volume 129 Issue 10, pp 1032-1035. E Kyriakidou, T Howe, B Veale, S Atkins,	The Journal of Laryngology & Otology, Volume 129 Issue 10, pp 1036-1039. S S Bakshi,	The Journal of Laryngology & Otology, Volume 129 Issue 10, p 1040. M R Ahmed,	The Journal of Laryngology & Otology, Volume 129 Issue 10, pp 1040-1041. Elfy B Chevretton, Sherif Haikel, Ann Sandison, Steve Connor, Ata Siddiqui,	The Journal of Laryngology & Otology, Volume 129 Issue 10, pp -.